The Airbus E-Fan is a technology demonstrator of a fully electrically-powered, all-composite general aviation training aircraft. The benefits of hybrid power trains are hotly debated, not least within The Engineer’s comment section. While electric propulsion obviously cuts emissions of propulsion systems in use – that is to say on the road for hybrid vehicles and in the sky for aircraft – the emissions associated with battery charging might or might not outweigh these benefits, depending on who you ask. While most attention has focused on land vehicles, because the technology exists and is commercially viable today, development of hybrid fossil fuel and electrically-powered aircraft is continuing rapidly even though no commercial hybrid yet exists. With the energy demands of flight so much greater than those of ground transport, the question of whether there is any environmental benefit is even more difficult to answer. Aerospace engineers from the University of Illinois have attempted to investigate the matter, and their results appear in a paper in the Journal of Aircraft. According to co-author Philip Ansell, the aspect of the subject that has not been studied is the carbon impact associated with recharging the batteries. “You can get a fuel burn reduction, but if the cleanliness of the electrical grid that’s being used to charge the battery system is not included, you’re missing a significant part of the carbon emissions total,” he said. The study compared CO2 emissions per kilowatt hour for each state across the US, mapping how much carbon is produced per unit of energy. 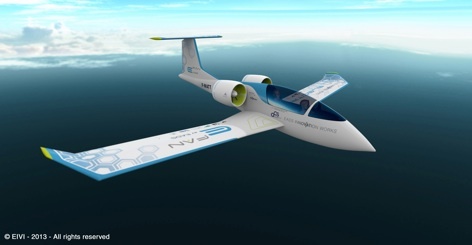 The researchers looked at a model commercially-acceptable hybrid-electric aircraft, able to carry the same number of passengers and cover the same distances as a current all-fossil fuel aircraft: a single aisle aircraft with approximately 140 passengers. They varied proportion of power across the propulsion driveshaft that was electrically derived, looking at scenarios where 12 .5 per cent, 25 per cent or 50 per cent of the power came from an electric motor, and assessed the cost in terms of CO2 emissions. The most feasible configuration from model was a propulsion system that uses a 50 per cent electrical drivetrain with a battery specific energy density of 1000W hours per kilogram. This would produce 49.6 per cent less life-cycle CO2 than a model commercial aircraft.